Chocolate-based drinks, made from cacao beans, date back to more than 4,000 years ago. Dark chocolate, mixed with different spices or added to other drinks like wine, was enjoyed even during the Mayan civilization. In fact, cacao beans were so valued in ancient Mexico that they were used as currency to purchase small items or services. Spanish royalty included cakes of cacao in marriage dowries. Today, chocolate is still made from cacao beans harvested from the cacao tree. This is a relatively small evergreen tree (averaging 15-26 feet tall) that is native to tropical regions of South America. The beans have an intensely bitter taste, and must be fermented before they develop their typical flavor. After fermentation, they are dried, cleaned, roasted, de-shelled and melted to form chocolate liquor. The liquor then takes different forms—baking chocolate without additions of sugar, milk chocolate with additions of milk solids and sugar, and white chocolate containing only cocoa butter, milk solids, and sugar but no cocoa solids. These are some of the more popular forms. There is another form of chocolate called blond chocolate, but this form is much rarer than the other types. It is easy to see why chocolate is such a popular food type, apart from its unique and attractive flavor, it is a very versatile product. It can be incorporated into many foods easily, making it appropriate for all kinds of dining, ranging from casual to fine dining. Chocolate can be molded into different shapes, paired with almost any fruit, nut, or crème, can be textured as hard, soft, sticky, as a mousse, with a liquid center or as a coating for other foods like pretzels and donuts. It can be used in many kinds of beverages, both hot and cold. Known for its mood-enhancing properties and being chockful of healthy antioxidants, chocolate is the ultimate comfort food! Humble chocolate chip cookies and brownies are as beloved as their fancier counterparts like Liquid Chocolate Cake which pairs chocolate with raspberries, cardamom, and Merlot. Then there is Chocolate Babka, a rich brioche dough swirled with chocolate, almonds, and cinnamon and then topped with brown sugar streusel and usually eaten for breakfast. You could try a White Chocolate Mocha, the steamy drink that warms both body and soul when the skies are dreary! 1 ¼ cups 2% milk – pour into a steaming pitcher and heat to 158 degrees F using the steaming wand. Then add to mug, managing the resulting foam with a spoon. 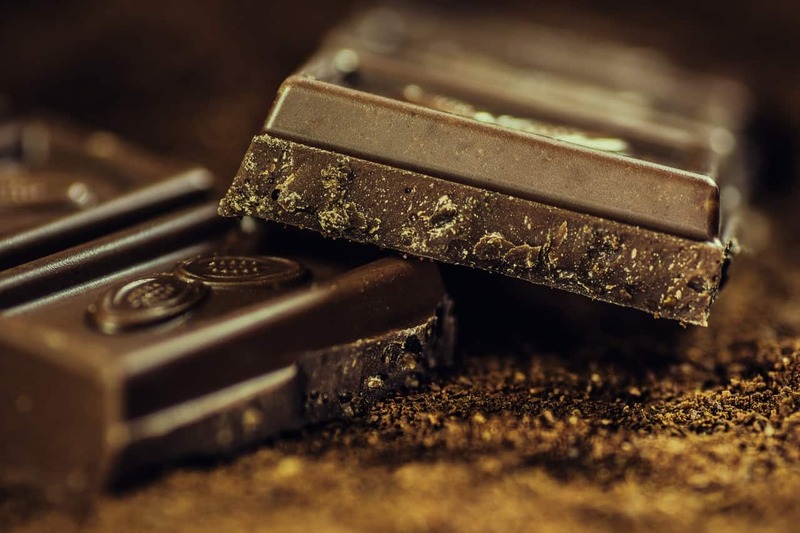 Although chocolate is relatively high in calories, it’s reputation as a health food is increasing. The U.S. alone consumes more than half the world’s supply of chocolate. 92% of the U.S. consumption is milk chocolate, but varieties like dark chocolate, are gaining ground. The U.S. chocolate market is expected to exceed $20 billion by 2025 and has been growing on an average rate of over 4% since 2008. The bulk of the production comes from millions of farmers with small plots from countries like Ivory Coast, Ghana, and Indonesia. The cacao tree takes 4-5 years to mature and while a tree may have 6,000 flowers in a year, it might have only 20 pods. About 400 pods are required to produce 1 pound of cocoa paste. Claims have been made for increased cardio-vascular health after consuming dark chocolate. Even the smell of chocolate has been claimed to increase theta brain waves, triggering relaxation and lowering stress. Dark chocolate is claimed to improve blood flow and lower blood pressure. It is a source of antioxidants and different minerals like zinc and magnesium. Can healthy taste more delicious? The scientific name for the cacao plant is Theobroma cacao, which is Greek for God-food. And food of the Gods it has truly proven to be.